Japanese journalist cosmonaut, 1989-1990. Graduated from the University of Tokyo in Chinese language Journalist, Tokyo Broadcasting Corporation. Reporter for world news with TBS, reporting from Moscow and then again from Tokyo. Status: Inactive; Active 1989-1990. Born: 1964-09-15. Birth Place: Zama City, Kanagawa. Family: Cosmonaut. Country: Japan. Spacecraft: Mir. Flights: Soyuz TM-11 Kosmoreporter. Agency: Tokyo Broadcasting. Bibliography: 4452. Birth of Ryoko Kikuchi - . Nation: Japan. Related Persons: Kikuchi. 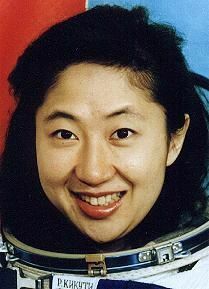 Japanese journalist cosmonaut, 1989-1990. Graduated from the University of Tokyo in Chinese language Journalist, Tokyo Broadcasting Corporation. Reporter for world news with TBS, reporting from Moscow and then again from Tokyo..
1989 August 17 - . Japanese Commercial Cosmonaut Training Group selected. - . Nation: Japan. Related Persons: Akiyama, Kikuchi. Japanese journalists trained for a commercial flight to the Mir space station..
1990 December 2 - . 08:13 GMT - . Launch Site: Baikonur. Launch Complex: Baikonur LC1. LV Family: R-7. Launch Vehicle: Soyuz-U2. Soyuz TM-11 - . Call Sign: Derbent (Derbent - Russian city). Crew: Afanasyev, Akiyama, Manarov. Backup Crew: Artsebarsky, Kikuchi, Krikalyov. Payload: Soyuz TM s/n 61. Mass: 7,150 kg (15,760 lb). Nation: Russia. Agency: MOM. Program: Mir. Class: Manned. Type: Manned spacecraft. Flight: Soyuz TM-10, Soyuz TM-11, Soyuz TM-11 Kosmoreporter. Spacecraft Bus: Soyuz. Spacecraft: Soyuz TM. Duration: 175.08 days. Decay Date: 1991-05-26 . USAF Sat Cat: 20981 . COSPAR: 1990-107A. Apogee: 400 km (240 mi). Perigee: 367 km (228 mi). Inclination: 51.60 deg. Period: 92.20 min. Docked with Mir. Mir Expedition EO-08. Transported to the Mir manned orbital station the international crew consisting of the cosmonauts V M Afanasyev, M Kh Manarov, and T Akiyami (Japan) for the purpose of carrying out joint work with the cosmonauts G M Manakov and G M Strekalov. Launched jointly with the private Japanese company TBS. The Japanese television network ended up paying $ 28 million for the first commercial flight to Mir to put Akiyama, the first journalist in space aboard Soyuz TM-11. Akiyama made daily television broadcasts.